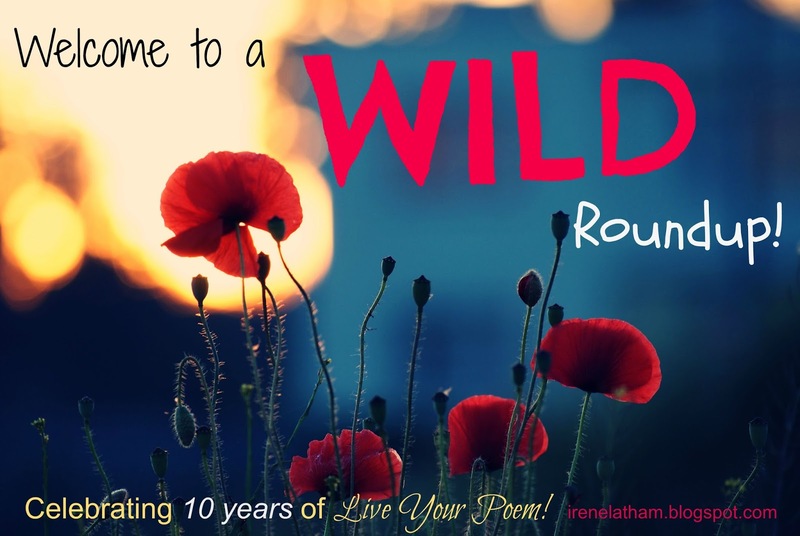 The Poem Farm: Happy Wild Blogiversary to My Friend Irene! Happy Wild Blogiversary to My Friend Irene! Welcome to today's celebration! 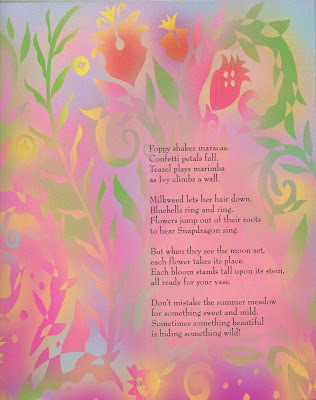 I offer my poem from SHARING THE SEASONS, edited by Lee Bennett Hopkins and illustrated by David Diaz. Students - Today is a special day! My friend, poet and author Irene Latham, is celebrating the 10th anniversary of her blog! Here in the world of blogging, people call that a blogiversary. Isn't that a funny thing about writing...how we can make up our own words? Well, when a good friend is celebrating, she will often invite friends to join her, and this is what Irene has done today. Over at her blog, Live Your Poem, you can find all kinds of posts celebrating the world WILD, Irene's favorite one little word for this year. I suggest visiting her place today, checking out her poems, and wishing her a Happy blogiversary! Remember this...when you wish to celebrate something, you can do so with writing. You can celebrate your own milestones with writing, and you can celebrate others with your writing too. Words are gifts. Something true about poetry is also true in my poem above. Poetry sometimes seems sweet and calm...but often, there is much wildness underneath. A writer must be willing to explore wild places within her or himself to find the poems and stories and ideas that he or she is meant to write. Irene is one writer I admire, one who could not be kinder or more genuine...and one who is truly willing to explore the wild questions and glories she finds out and inside of her. To celebrate today, I offer a copy of SHARING THE SEASONS, by Lee Bennett Hopkins and illustrated by David Diaz, the book in which you can find the poem above, to a commenter on this post. Please comment by this Friday, November 13, to be entered into this drawing. Thank you, Irene, for being an inspirer. Happy 10th blogiversary to you, my friend! "Sometimes something beautiful/is hiding something wild." Wonderful poem for Irene, Amy. I love all the lines about the flowers. "Daisy is a flirt." Terrific! Beautiful! 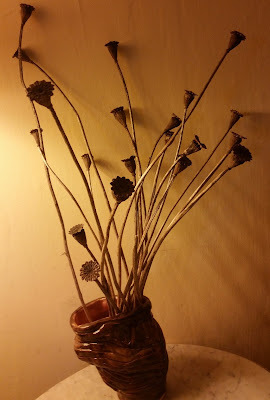 I love that pot of dried poppies. I love your poem, Amy--it's one of the standouts in a standout anthology (one of my favorites of Lee's). I already have a copy, so don't put me in the drawing, but thanks for sharing this! 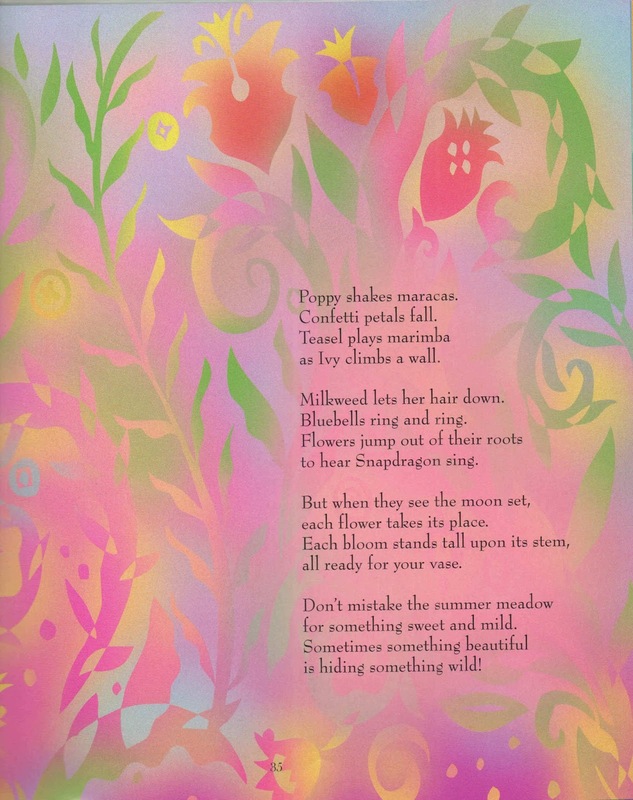 The poem is beautiful and with the illustration, it is exquisite! Definitely among my favorite LBH anthologies as well! Your poem is the perfect example of this: "Poetry sometimes seems sweet and calm...but often, there is much wildness underneath." Thanks for the gift of your words today, Amy. This reminds me of the secret life of teachers, too. There is always so much more to a person than what you see. Reading between the lines, joining the flowers some evening. Everything is wilder than it seems. What a wild party in the meadow--love the sounds of those talented flowers! 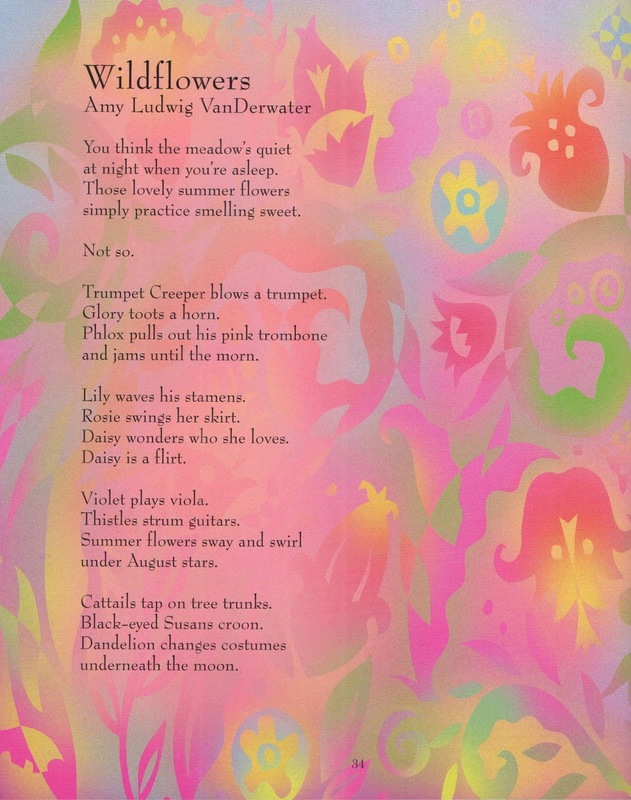 I absolutely loved this poem and am captivated by the idea of the meadow of flowers jammin' through the moonlit night. So many layers here! "A writer must be willing to explore wild places within her or himself..." So true and something I'm still working on. As I write more and more, I see patterns in what I write, but I've also begun to suspect there's a pattern to what I'm not writing. Thanks for a wonderful gift of words to start my day and some inspiration to take a walk on the wild side. "Sometimes something beautiful is hiding something wild." Love. That. Line. Your poem is jammin'! I love the milkweed line :). Thanks for sharing this fun and lovely poem, Amy! What a fun flower party! I love this poem! What a lovely idea - the noisy flowers. 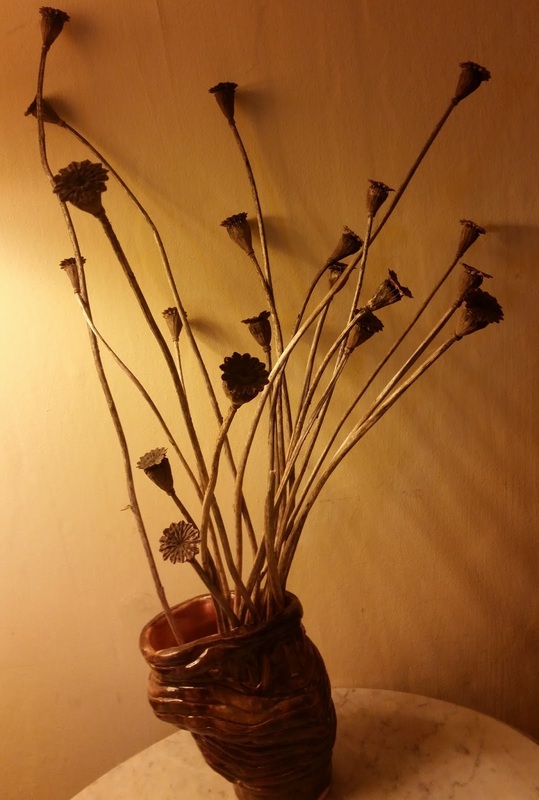 When I was a child, I owned a Golden Book of Wildflowers. One of my favorites. You take a child beyond identifying a flower to identifying a wildflower's sense of playfulness. Loved it! I would love to win a copy of this book. Please enter my name in the drawing. Happy Blogiversary to you AND your muse. Really, I cannot imagine a world without poetry. I'm fixing to celebrate soon for finishing a 10 week writing class that has stretched and grown my writing...poetry included! Thank you, Amy Vanderwater for sharing poetry in all the ways that you do!